Only products that have the correct CE Certification markings are guaranteed to comply with European PPE legislation. The three categories of 89/686/EEC, the European Directive which regulates PPE, take into consideration the complexity of protective equipment. Category 1 protective equipment for instance, is of simple design and used in situations where the user can determine the necessary protection level. Category 2, on the other hand, covers equipment that is neither simple nor complex. While this is subject to external assessment, it is not subject to any EC quality assurance system. Category 3 protective equipment is signalled on ProGARM Arc Flash and flash fire garments by a four-digit number attached to the CE Marking. This number indicates that the piece of PPE is continually checked by the relevant independent body for conformity. All ProGARM’s PPE products comply with the requirements in European Directive 89/686/EEC. Beware when purchasing PPE from other manufacturers. Some claim that the garment meets the necessary CE requirements when only the fabric may be certified. If you study the care label, you may find that the EN symbol is missing and there is simply a note about which standards the fabric conforms to. This indicates a lack of protection across the garment. 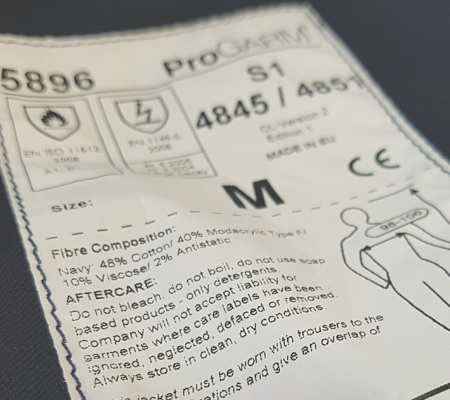 ProGARM garments are fully certified to the standards indicated on the care label. You will also find detailed information on our care labels about EN Standards, washing instructions and the composition of the fabric, along with a batch number for traceability plus clear sizing advice. This forms part of ProGARM’s commitment to accessibility throughout our range of Arc Flash clothing.